Description: While Hancock’s command demonstrated north of the James River at Deep Bottom, the Union V Corps and elements of the IX and II Corps under command of Maj.
Gen. G.K. Warren were withdrawn from the Petersburg entrenchments to operate against the Weldon Railroad. At dawn August 18, Warren advanced, driving back Confederate pickets until reaching the railroad at Globe Tavern. In the afternoon, Maj. Gen. Henry Heth’s division attacked driving Ayres’s division back toward the tavern. Both sides entrenched during the night. 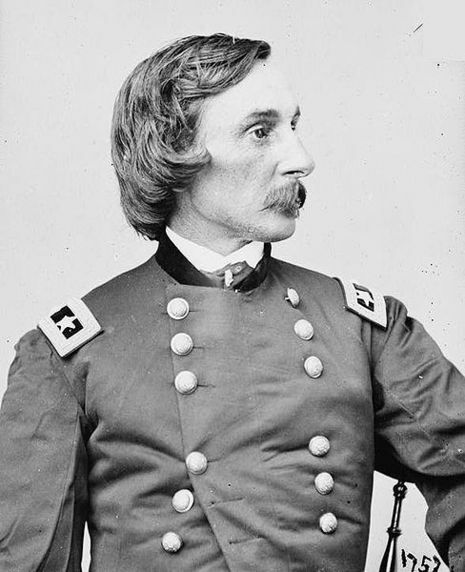 On August 19, Maj. Gen. William Mahone, whose division had been hastily returned from north of James River, attacked with five infantry brigades, rolling up the right flank of Crawford’s division. Heavily reinforced, Warren counterattacked and by nightfall had retaken most of the ground lost during the afternoon’s fighting. On the 20th, the Federals laid out and entrenched a strong defensive line covering the Blick House and Globe Tavern and extending east to connect with the main Federal lines at Jerusalem Plank Road. On August 21, Hill probed the new Federal line for weaknesses but could not penetrate the Union defenses. With the fighting at Globe Tavern, Grant succeeded in extending his siege lines to the west and cutting Petersburg’s primary rail connection with Wilmington, North Carolina. The Confederates were now forced to off-load rail cars at Stony Creek Station for a 30-mile wagon haul up Boydton Plank Road to reach Petersburg. Confederate general John C.C. Sanders was killed on August 21. The Battle of Globe Tavern, also known as the Second Battle of the Weldon Railroad, fought August 18–21, 1864, south of Petersburg, Virginia, was the second attempt of the Union Army to sever the Weldon Railroad during the Siege of Petersburg of the American Civil War. A Union force under Maj. Gen. Gouverneur K. Warren destroyed miles of track and withstood strong attacks from Confederate troops under Gen. P.G.T. Beauregard and Lt. Gen. A.P. Hill. It was the first Union victory in the Richmond-Petersburg Campaign. It forced the Confederates to carry their supplies 30 miles (48 km) by wagon to bypass the new Union lines that were extended farther to the south and west. As the siege of Petersburg began to take hold, Union Lt. Gen. Ulysses S. Grant continued to look for ways to sever the railroad links supplying the city of Petersburg, Virginia, Confederate Gen. Robert E. Lee's army, and the Confederate capital of Richmond. One of these critical supply lines was the Weldon Railroad, also called the Petersburg and Weldon Railroad, which led south to Weldon, North Carolina, and the Confederacy's only remaining major port, Wilmington, North Carolina. In the Battle of Jerusalem Plank Road, June 21–23, 1864, the II Corps was able to destroy a short segment of the Weldon before being driven off by the Third Corps of Lee's Army of Northern Virginia. 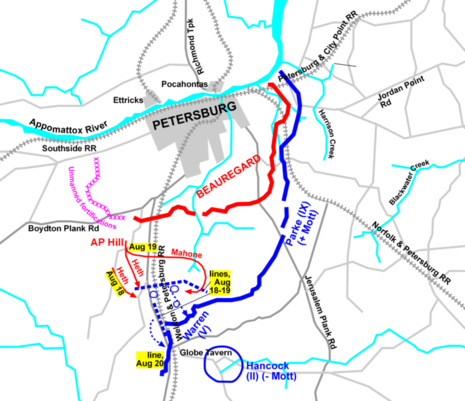 In August, the II Corps operated north of Petersburg, threatening Richmond and its railroads in the Second Battle of Deep Bottom. Simultaneously, Grant planned another attack against the Weldon. The V Corps supported by units from the IX Corps, II Corps, and a small cavalry division commanded by Brig. Gen. August Kautz, was chosen for the attack under the overall command of the V Corps commander, Maj. Gen. Gouverneur K. Warren. While the overall Confederate commander, Gen. Robert E. Lee, was observing at the Deep Bottom battle, Gen. P.G.T. Beauregard was the senior commander at Petersburg. Lt. Gen. A.P. Hill commanded the Third Corps, Beauregard's primary infantry force. Grant remarked to his staff, "The President has more nerve than any of his advisors." At dawn on August 18, Warren advanced to the south through rain and over muddy roads, pushing aside Confederate pickets and a cavalry brigade, and reached the railroad at Globe Tavern around 9 a.m. Parts of the division under Brig. 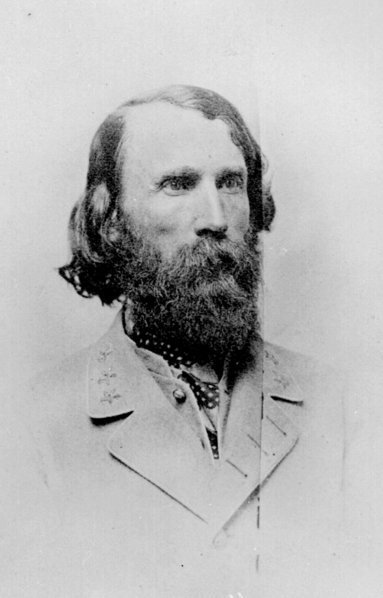 Gen. Charles Griffin began to destroy the track while a brigade from Brig. Gen. Romeyn B. Ayres's division formed in line of battle and moved north to block any Confederate advance from that direction. Brig. Gen. Lysander Cutler's division was held in reserve. Ayers encountered Confederate troops at about 1 p.m. and Warren ordered the division under Brig. Gen. Samuel W. Crawford to move forward on Ayres's right in an attempt to outflank the Confederate left. A.P. Hill sent two brigades of Maj. Gen. Henry Heth's division and a brigade from Maj. Gen. Robert F. Hoke's division to meet the advancing Union divisions. At about 2 p.m. they launched a strong attack and pushed the Union troops back to within less than a mile of Globe Tavern. Warren counterattacked and regained his lost ground. His men entrenched for the night. Reinforcements arrived during the night—the Union IX Corps under Maj. Gen. John G. Parke (which had been relieved from duty in the trenches around Petersburg as Hancock's II Corps troops returned from Deep Bottom) and Confederate Maj. Gen. W.H.F. "Rooney" Lee's cavalry division and three infantry brigades from the division of Maj. Gen. William Mahone. Contact was limited to skirmishing through the heavy rain most of the day on August 19. In the late afternoon, Mahone launched a flanking attack that found a weak spot in Crawford's line, allowing the Confederates to rush into the Union rear, causing hundreds of Crawford's men to flee in panic from the fire they were receiving from two directions. Crawford galloped amongst his men, attempting to rally them, and was almost captured. Almost two full brigades were lost as prisoners. While Mahone attacked the Union right, Heth launched a frontal assault against the center and left, which was easily repulsed by Ayres's division. The XI Corps counterattacked and the widespread hand-to-hand fighting ended at dusk. Heavy rains prevented any significant fighting on August 20 and on the night of August 20–21, Warren pulled his troops back two miles (3 km) to a new line of fortifications, which were connected with the main Union lines on the Jerusalem Plank Road (present-day U.S. Route 301, Crater Road). Fair weather returned on the morning of August 21 and the Confederates attacked beginning at 9 a.m., with Mahone striking the Federal left and Heth the center. Both attacks were unsuccessful against the strong entrenchments and resulted in heavy losses, particularly in the brigade of Brig. Gen. Johnson Hagood. Brig. Gen. John C. C. Sanders of Mahone's division, at 24 one of the youngest Confederate generals during the war, was killed during the assault. By 10:30 a.m., the Confederates withdrew, leaving several miles of the Weldon railroad in Union hands. We have just repulsed an attack of Mahone's division from the west of the railroad. Whipped it easily. Union casualties at Globe Tavern were 4,296 (251 killed, 1,148 wounded, 2,897 missing/captured), Confederate 1,620 (211 killed, 990 wounded, 419 missing/captured). The Confederates had lost a key section of the Weldon Railroad and were forced to carry supplies by wagon 30 miles (48 km) from the railroad at Stony Creek up the Boydton Plank Road into Petersburg. The Union army had gained its first victory during the Siege of Petersburg and achieved a major objective. Grant had severed the Weldon and extended his siege lines to Globe Tavern, but this was not yet a critical problem for the Confederates. A member of Lee's staff wrote, "Whilst we are inconvenienced, no material harm is done us." It seems to me that when the enemy comes out of his works and attacks and is repulsed he ought to be followed vigorously to the last minute with every man. Holding the line is of no importance whilst troops are operating in front of it. Wanting to complete his army's control over the railroad, Grant recalled the II Corps from its failed attempt at Deep Bottom to destroy the Weldon further south, an action that resulted in the Second Battle of Ream's Station on August 25.